Many people with an RTL-SDR have had fun receiving NOAA and METEOR low earth orbit (LEO) weather satellite images. However, a step up in difficulty is to try and receive the geostationary orbit (GEO) weather satellites like GOES. These satellites are locked to a fixed position in the sky meaning there is no need to do tracking, however since they are much further away than LEO satellites, they require a 1m+ satellite dish or high gain directional antenna to have a chance at receiving the weak signal. The GOES satellites transmit very nice high resolution full disk images of the earth, as well as lots of other weather data. For more information see this previous post where we showed devnulling’s GOES reception results, and this post where we showed @usa_satcom’s presentation on GOES and other satellites. Over on his blog and Twitter account (@lucasteske) Lucas Teske has been documenting his work in building a GOES receive system. 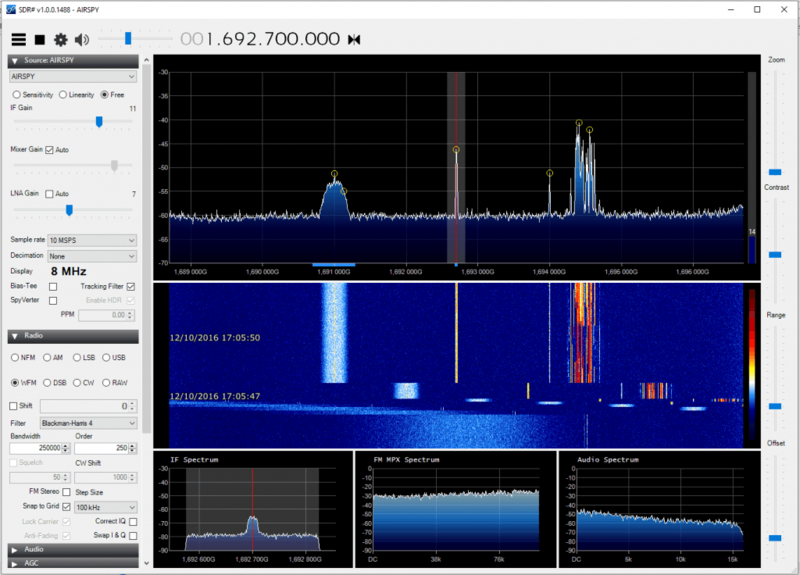 The SDR he uses mostly is an Airspy, but recently he showed that our RTL-SDR Blog V3 dongle is also capable at receiving the GOES signal. The nice thing about Lucas’ post is that he documents his entire journey, including the failures. For example after discovering that he couldn’t find a 1.2m offset satellite dish which was recommended by the experts on #hearsat (starchat), he went with an alternative 1.5m prime focus dish. Then after several failed attempts at using a helix antenna feed, he discovered that his problem was related to poor illumination of the dish, which meant that in effect only a small portion of the dish was actually being utilized by the helix. He then tried a “cantenna”, with a linear feed inside and that worked much better. Lucas also discovered that he was seeing huge amounts of noise from the GSM band at 1800 MHz. Adding a filter solved this problem. For the LNA he uses an LNA4ALL. To position the antenna Lucas used the Satellite AR app on his phone. This app overlays the position of the satellite on the phone camera making it easy to point the satellite dish correctly. He also notes that to improve performance you should experiment with the linear feeds rotation, and the distance from the dish. His post of full of tips like this which is very useful for those trying to receive GOES for the first time. In future posts Lucas hopes to show the demodulation and decoding process. GOES signals received with the dish, LNA4ALL, filter and an Airspy. Meteosat-10 (MSG-3) on 0ºW/E is operational in LRIT 1691 Mhz. Images not encrypted at 02:45, 05:45, 08:45, 11:45, 14:45, 17:45 20:45 and 23:45 UTC. To receive the signal directly you will have to have at least one satellite dish prime focus or offset 1.3-1.8m, a feeder for 1691 Mhz, BPF filter, LNA, Airspy receiver and LRIT program to decode. Here are talking L-band, no UHF, let alone DCP interrogation that has no interest to us. Do not bother, Meteosat its LRIT is encrypted. Are you sure all of the products are? Google tells me that once every six hours it’s unencrypted. Also, the Western part of Europe ought to be able to see GOES East, no? Are you sure all of the products are? Google tells me that once every three hours it’s unencrypted. (See the current Meteosat 10 Direct Dissemination Scheme documentation). The polarization of geostationary meteorological satellites is linear. No circular. Not all of the transmissions. But indeed LRIT signal is linear. Just keep in mind that a circular polarized feed can receive linear signals just fine.